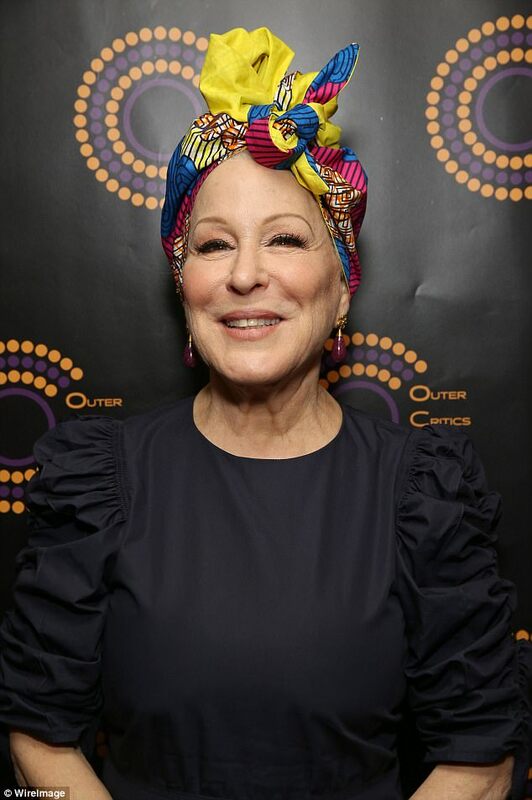 Bette Midler put on a colorful display as she arrived at the Outer Critics Circle Awards in New York City on Thursday. 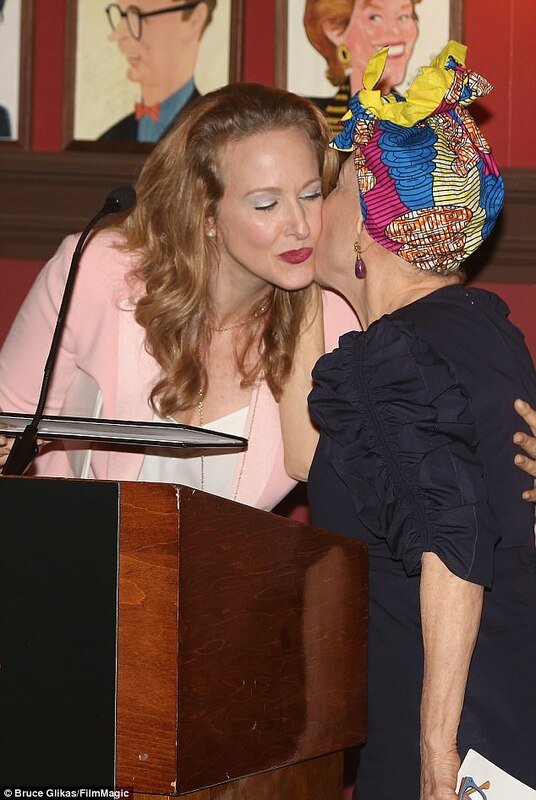 The 71-year-old star wore a boldly patterned head scarf over her hair for the occasion along with a pair of purple pendant earrings. 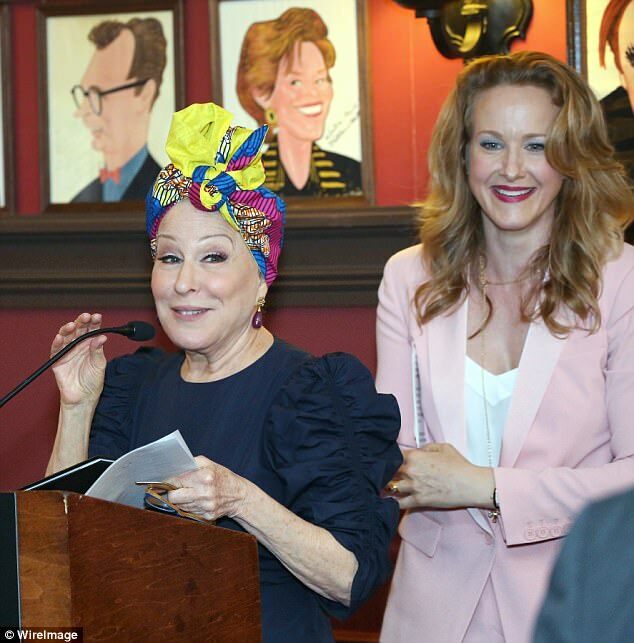 Midler was there to pick up the prize for Outstanding Actress In A Musical for her Broadway revival of Hello, Dolly! The veteran actress paired her headscarf with a black dress with slightly ruffled half sleeves. She kept her make-up simple for the afternoon ceremony using black mascara and brown liner around her eyes while adding rouge and a splash of dark pink lip color. llo, Dolly! also picked up the award for Outstanding Revival Of A Musical and Midler’s co-star Gavin Creel picked up Outstanding Featured Actor In A Musical. It also won awards for Outstanding Choreographer and Outstanding Orchestrations. 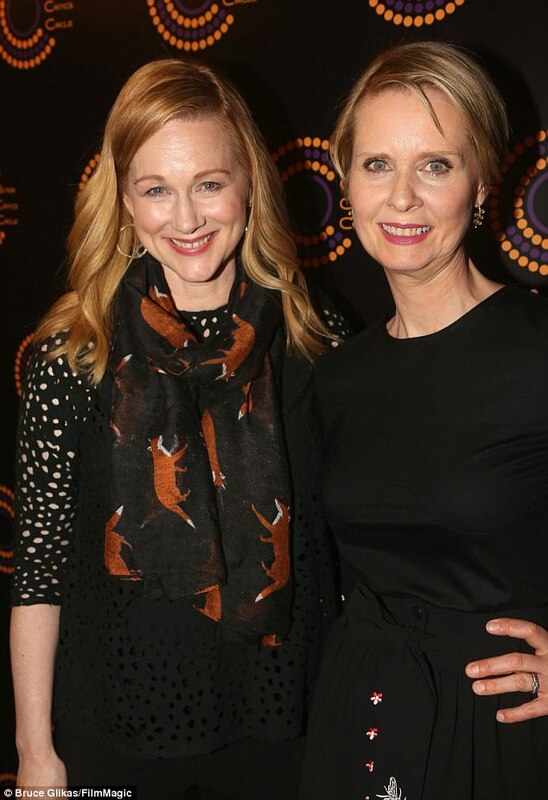 At the event, too, were Broadway co-stars Laura Linney and Cynthia Nixon. The two star together in The Little Foxes and Linney won Outstanding Actress In A Play while Nixon won Outstanding Featured Actress In A Play. Now in its 67th year, the Outer critics Circle Awards honor the best of Broadway and off-Broadway theatre. Linney, 53, wore a black scarf aptly decorated with brown and white foxes over a crocheted black top. She added wide legged black pants and shoes and left her long reddish blonde hair loose, accessorizing with gold hoop earrings. Nixon, 51, also opted for a black ensemble pairing a short-sleeved top with a below-the-knee skirt featuring bee and flower motifs. She completed her outfit with a pair of chunky black sandals.